The first charge is thought to stem from a question he answered in 2002 pertaining to his feelings about reciting the Turkish pledge of allegience, stating he is a Turk which he is not, during his youth in Turkey. The second charge is pertaining to an article he had written. He believes the charge against his article is because it is taken out of context. 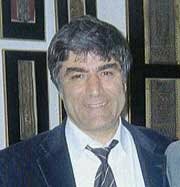 He had actually written a series of articles to encourage Armenians in Diaspora to put down their hatred of the Turks, and become more involved with Armenian issues. This was his crime. At that time, he received a sencence of six months which was suspended. It has come to the attention of many intellectuals and journalists that he is now being threatened with 4 1/2 years imprisonment for 'influencing the judiciary.' This makes the 3rd charge against this journalist. The Turkish government is chosing to see this as judicial influencing because Mr. Dink declared he would leave the country if his appeal was not successful. The country's most famous novelist, Orhan Pamuk, was charged under the law with insulting Turkey, for telling a Swiss newspaper in February that "30,000 Kurds and 1 million Armenians were killed in these lands, and nobody but me dares to talk about it." This is considered by Turkey to be an insult, and it is not legal to speak any workds in Turkey, even when true, that insult the government. Three other journalists were also charged with trying to influence the judiciary after they criticized Dink's conviction, including Mr. Dink's son. He says that his aim is to alleviate the tensions between Turkey and Armenia. Dink is appealing against the conviction. Protesting the decision to bring Hrant Dink to trial for the peaceful exercise of his right to freedom of expression, and requesting that the charges against him be dropped. Emphasising that the right to freedom of expression is guaranteed by the International Covenant on Civil and Political Rights and the European Convention on Human Rights, to which Turkey is a signatory. Sources: ISTANBUL, Turkey (AP), English Pen, Free expression is no offense.